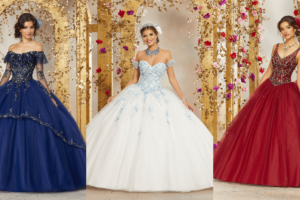 Besides the waltz, one of the most popular Quinceanera traditions is choosing a special couple to serve as your Quince padrinos. Some girls may struggle with this if they have no idea who to choose or when perhaps their parents have already chosen for them. Sometimes, choosing a Quince Madrina and/or padrino is such an ordeal that many Quinceaneras opt not to have them as part of their celebration. If you’re still in limbo regarding this topic, read along and decide what’s best for you after reading the pros and cons. Most madrinas and padrinos love being involved in the planning process of their Quince girl’s celebration which could work in your advantage if you’re feeling somewhat lost when it comes to making up your mind. Asking people to “sponsor” your party is of bad taste. However, if they offer to pay for something, you should kindly and appreciatively accept their offer. Imagine choosing your color palette, finding the perfect dress, prepping your DIY decorations and sharing all these moments with someone who is as special to you as you are to them. Just as you will experience those lovely moments you will also have to deal with stress and maybe even some drama, but at times is easier to deal with it if you know you count with your madrina and/or padrino’s support. Although it is great to have other involved in the planning of your Quince, not all Quinceaneras like that “extra help” and prefer to do things solo. If your madrina and padrino are overly eager to help you plan you might end up losing your head at one point. Having different styles may affect the planning, especially if they are paying for some of the services or decorations. Some people feel the offered financial support gives them a right to choose rather than meet you halfway. Some parents choose and ask couples they’ve known for years (sometimes barely met) to be your madrina and padrino but in reality you rarely ever interact making the whole planning and celebration a bit weird. Ideally everything will go smoothly but if you happen to face several obstacles and don’t have someone to vent with, someone who truly understands you since they’ve been with you from step 1 through the end, you could end up losing your head. So what do you say? Did this information help you to make up your mind or perhaps convince you of having a talk with your Quince madrina and Quince padrino?